Remember when you were little and you got into your parent's cooking pans? Well, that's basically what RePercussion did, except they add lights, theatrics, and trashcan lids to the equation. How cool is that? From Goffstown, New Hampshire to the big stage on NBC's America's Got Talent, these young men have certainly come a long way just to perform for you! rePercussion is an extraordinary comedy drumming experience! Going beyond interactive drumming, they blend sight, sound, and laughter bringing to the stage a highly entertaining, mind-blowing experience. 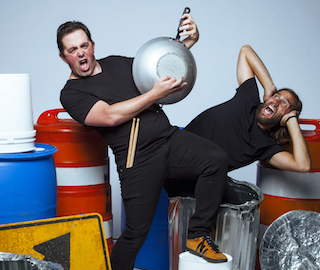 Blurring the lines between electronic music, drum line, rock, and slapstick, rePercussion uniquely combines drumming, comedy, and crowd interaction. Each show is one-of-a-kind. rePercussion holds the World Record for leading the world's largest Airdrum Ensemble! Composed of high-energy entertainment veterans, rePercussion has performed for hundreds of thousands of people in venues around the world. Saturday, April 27, 2019 • 1:00 P.M.